Roger Federer was at his imperious best on Friday, demolishing world number 10 Jo-Wilfried Tsonga 6-2, 6-3, 6-2 to advance to the Australian Open final. The Swiss ace was at his brilliant best as he outclassed his French opponent to wrap up a lop-sided victory in under 90 minutes at Melbourne Park. The world number one will meet Britain's Andy Murray in Sunday's final in a rematch of the 2008 US Open final, which Federer won. 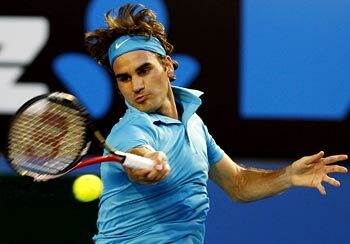 Federer has already won the Australian Open three times, in 2004, 2006 and 2007, and is now through to his fifth final after losing an epic five-set clash with Rafa Nadal last year. The Swiss maestro never gave his French opponent a sniff, using a clever variation of deft touches, angles and change of pace as he raced past the 2008 Australian Open finalist. "I'm happy. I played solid. I didn't play exceptional. I did enough and I'm through. It's nice," the world number one said. "No wasted energy that's for sure ... I'm very surprised at how the match went. I expected differently. Jo-Wilfried Tsonga left Melbourne Park deflated after Roger Federer delivered a comprehensive knockout to advance to the Australian Open final. The 10th-seeded Frenchman, who made the 2008 Australian Open final and beat Federer in their last match in Montreal last year, was sheepish afterwards when asked if he thought if there was anyone on the men's tour who could beat the top seed in his current form. 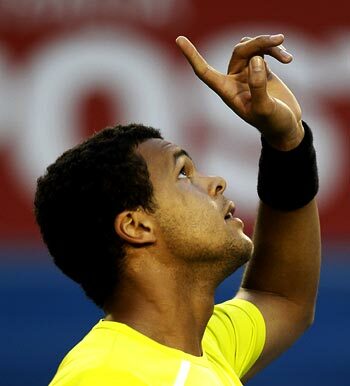 "I think nobody," Tsonga said. "It was tough to play against him today. He took the ball earlier than me, and he was just better than me. "He was really good, and that's it." Serena Williams completed one half of an Australian Open double when she and older sister Venus Williams won the women's doubles title. Serena heads into Saturday's singles final against Justine Henin in Melbourne on a winning note after defending her doubles crown with a 6-4, 6-3 victory over Zimbabwe's Cara Black and American Liezel Huber at Rod Laver Arena. 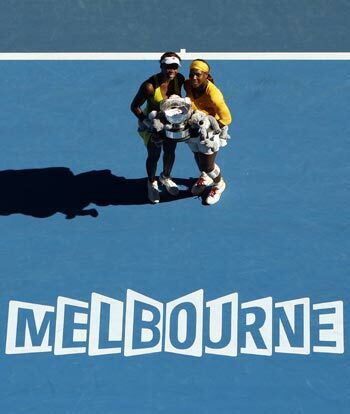 The win gave them their 11th Grand Slam doubles championship and their fourth at Melbourne Park -- and also preserved their perfect record in grand slam finals. "I guess I was really focused and my serve was really working today," Venus said after not conceding a single service break.